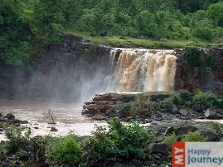 Located at the border of Gujarat and Maharashtra, Saputara is the only hill station of Gujarat. At a height of 1000 m above sea level, this magnificent hill station is located in the impenetrable forest region of Dangs of Sahyadri Climate. Saputara, which means Adobe of Serpent, is the place where you can plan your startling vacation at anytime of the year, thanks to the pleasant temperature. In fact, summers here are also not too hot and the maximum temperature goes up to 28 degrees. It is a place of religious and legendary significance. It is believed to be the dwelling place of Lord Rama, for 11 years, during the time of his émigré. On the bank of river Sarpaganga, you can even see a deity of the serpent. It is the god, which is worshipped by the local tribes of the area. Holi is the festival which is celebrated with great charm and enthusiasm in this area, mainly by the local tribes. A hub of bio-diversity and natural vestiges, it is the place where you can spend some serene moments close to nature. Breezy air, landscapes covered with mists, will make your evenings quite pleasurable here. The picturesque beauty, spectacular views, vivacious culture and pleasant climate of Saputara, are the things which allure lots and lots of tourists every year. It is the place where you can enjoy the beauty and the ecstasy of water falling from heights in the form of cascades. This place provides a magnificent way to start your day with the astonishing view of sun rise and also offers a perfect end to your day with amorous sun set view. For nature lovers, this place is a delight to visit. The icing on the cake is the Saputara Lake, which provides magnificent scenic views. Boating facilities are available on the lake. Sailing slowly on the lake, with the backdrop of verdant forests and mesmerizing landscape, will leave you spellbound. It is a place which has something for everyone, if you want to know-more about the place, then visiting a museum here is worth it. Apart from it, the well maintained and lush green parks are ideal to spend some moments alone. One not to miss attraction of Saputara is the “Pushpak Ropeway”. This place is quite popular among children and adults. To make your vacation more pleasurable, you can look for amazing options like hotels, parks, swimming pools, theatre etc.